Spiders have long been accepted as a “good” pest to keep around the yard or home. In general spider are predatory to some degree and this feature has been exaggerated over time to where it’s not uncommon to hear people say “a good spider population around the house is better than a bug-man”. This is an example of a classic urban legend. Spiders may eat certain pests. But spiders will only appear where food is abundant. And they will not “control” or eradicate a given insect problem. In fact spiders appearing on your home or inside living spaces is a warning you best heed. Remember, they wouldn’t be around unless they were confident they can find food. That means you’ve got some kind of pest active needing attention and you’ll be best served by taking action before the problem escalates. In fact, recent data suggests spiders will move to an area only if the area can provide adequate food. This means they’re looking for an environment which has pests. In order for any spider to survive, they need a good healthy insect population. And they need to feed on a regular basis. Without a good supply of food, they will either die or relocate. The author has been in many attics and crawl spaces which had a lot of spider webs but the only spiders I was able to find were dead. These spiders had chosen poor web locations and paid the price. Conversely, healthy spiders on your homes exterior or in living spaces is sure sign pests abound. There are many types of spiders active throughout the United States. But in general, they come to our homes as either ground dwellers or web makers. Spiders which thrive on the ground are usually much stronger compared to their web building cousins. These brutes are aggressive, usually nocturnal, great hunters and rely on their strong grip and bite. They stalk food at night and will feed on just about anything they find. Some of these have toxins but in general, they don’t need it. When prey is identified, they will usually stalk within pouncing distance, crouch, leap, rip, shred, bite, grab and kill – all within a few moments. Web builders are spiders which are not built to be on the ground. They are usually more fragile, weaker, slower and not as well equipped to defend themselves when out of their webs. But what they lack in physical body strength they more than make up for with venom. In most cases, web makers are equipped with toxins that can kill insects quickly. In some cases these toxins are so strong they can be fatal to humans. Although data is limited and more research is needed to confirm suspicions, spider bites are no doubt more of a problem than currently recognized. 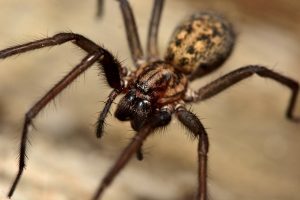 In fact, most everyone knows the impact of a brown recluse or black widow spider bite. And though most venomous spiders are less toxic, they do account for the vast amount of reported spider bites annually in the U.S.
Like many insect bites, individuals can have allergic reactions making a seemingly harmless spider lethal. For this reason, spiders should not be handled. The reason is obvious; one should never roll the dice only to learn the spider they choose to hold was able to make them seriously ill. In most cases, the type of spider you have will dictate the best treatment option. Crawling ground dwellers will cover large areas of turf and require yard treatments. Web makers will live on your home so focusing on the structure will be more productive. To best treat your problem, first identify if you have web making spiders or ground dwellers and follow the recommendations below. Spiders active in the yard will eventually get inside. Wolf spiders can cover 1/2 acre at night foraging for food. If allowed access to your yard, its just a matter of time before they get inside. Web makers like the common house spider or Black Widow will first find your homes siding on which to nest. From there, a few harmless webs will produce eggs sacs hatching hundreds of young spiders. These young spiders are so small they’ll easily find their way inside leading to problems in living spaces. In other cases, they end up in crawl or attic spaces and once established, can become the source of a steady stream of spiders making their way to living areas. To prevent spiders from getting inside, focus your treatments where it matters. For some, it means yard granules and spray. For others, total foundation spraying from ground to the roof will be required. The worse case scenario is when both spider types are active. This can most definitely happen but regardless, either can be managed. The key is to be aggressive outside the home. Once the outside is properly treated, you won’t have new activity inside. If your main problem are ground foraging spiders like the Wolf Spider, plan on treating as much of the yard as possible. These spiders can cover a large area on any give night. If you allow them to roam freely in the yard, some will end up in garages and other entry points. Eventually you’ll have an active infestation in the home. To control nocturnal ground foraging spiders, apply BIFEN GRANULES over all grass, flower beds and mulch areas with pine straw or wood chips. Ground dwelling spiders nest in these areas using small holes during the day. Bifen spread over the turf will both kill nesting spiders and keep them off your yard so no one will encounter them during the day. Bifen resembles wheat germ and when applied properly, won’t be notices. Use 1/5 lbs per 1,000 sq/ft of turf and plan on treating every 1-2 months when spiders are active. In general, treating once a month is suggested until the spiders are gone. Once no spider activity is detected, apply more every 2 months for maintenance. To distribute the granules properly, use a good GRANULE SPREADER. 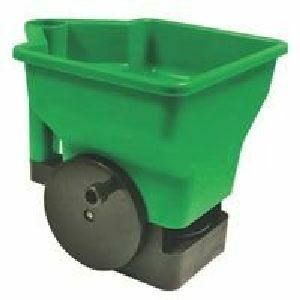 Ours will hold 2 lbs in the hopper and is well suited for treating over flower beds and other tight areas where using a traditional push spreader can be challenging. Since granules take time to “release”, they don’t kill quickly. Furthermore, granules need to be activated. This can be done by watering them in using an irrigation system. 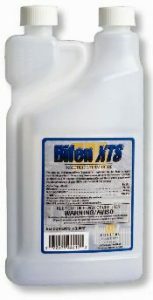 But the best way to get them active is to spray over the top using BIFEN XTS. 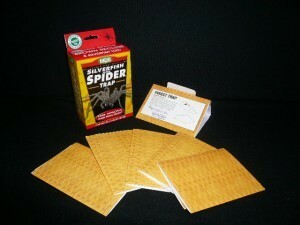 This active is fast acting on spiders and will quickly kill off any nesting in the yard when applied. Plan on using 1 oz per 5,000 sq/ft mixed with 3-5 gallons of water (cannot be shipped to New York). Any type of sprayer can be used to apply Bifen but you do need to use at least 3 gallons of water. Since water is the “carrier” of the agent, its important you use enough to ensure deep coverage into spider dens and nests. A good HOSE END SPRAYER is always a great way to apply Bifen; adding 1 oz to our sprayer and then filling it to the 5 gallon line on the sprayer will allow you to cover up to 5,000 sq/ft using your garden hose. For 10,000 sq/ft (1/4 acre), add 2 of and fill the sprayer half way with water. For small yards, CYONARA RTS will effectively do the same job compared to Bifen. Its less concentrated and comes in a hose end sprayer. Each jug will cover up to 18,000 sq/ft so for yards 5,000 sq/ft or less, you’ll get a good 3-4 treatments per jug. Treating the yard is important when managing ground dwelling spiders. But for web makers, the homes siding will be more important. 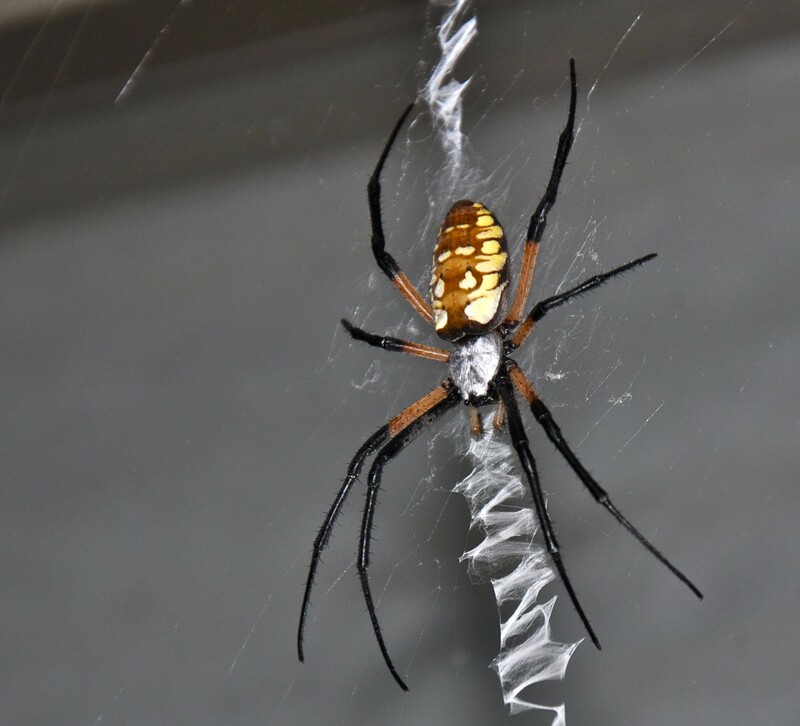 If you have spider webs under soffits, around gutters, behind shutters and in window corners, you’ll need to treat these areas to kill off nesting spiders. Web making spiders will bypass ground treatments because they tend to move by air. As young spiders, many will use webbing as “parachutes” so they can literally “fly” to new locations in search of good nest sites. Vertical obstructions like trees and structures will get in their flight patch and once they land, webs will form. If food is nearby, these spiders will grow to mature adults and reproduce. Once established on your home, its just a matter of time before then end up inside. To control the invasion, you first need to remove the spiders living on the homes exterior. This can be done by physically removing their webs and then spraying all surfaces to ensure they don’t rebuild. Spiders are stubborn. Knocking down their nests will give the impression they’re gone but in fact they’ll come right back and within a day or two, rebuild their lost home. That’s not to say removing spider webs won’t help; in fact its an important part of the spider control process. But for web removal to mean anything important, you must treat immediately after you remove the webs. To make web removal easy, use a WEB REMOVER WITH 10 FOOT HANDLE. These are “brush” like attachments that fit on the end of extension poles enabling you to “wipe” away and remove spider webs with little effot. Webster heads will fit by threading them onto the end of special extending rods we offer. They come in three sizes and should be used just before spraying. The small web remover is about 5 foot tall when contracted but when extended, about 10 feet. The next size up is the WEB REMOVER WITH 14 FOOT HANDLE. This unit is comprised of two rods each being about 7 foot long. This model is more “commercial” and can handle daily use afield. For the average home owner, this model is well suited for both inside and outside web removal and will last many years. The longest unit we have is the WEB REMOVER WITH 30′ HANDLE. It too is a commercial unit that can reach most any place around around the tallest of homes. It’s 30 feet in length and is comprised of 6 foot sections nested in one another. Each section is 6 foot long so the total length when fully extended is 30 feet. This tool is generally not needed for most homes but if you have a high reaching ceiling in your main entrance foyer or just a lot of spider webs 30-40 feet up around the outside of your home, this tool will make it easy to get them removed. It stands about 8 feet tall when fully collapsed and the average person using it can reach up over 35 feet when fully extended. 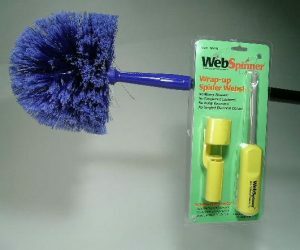 Another attachment that can also be used in your hand is the WEB SPINNER. This device is batter powered (you’ll need 2 “AA” batteries not included) and basically all you need to do is get turn the unit on and then get it close to a spider web. Like the way cotton candy is spun onto the the paper funnel that holds it, the Web Spinner will “wrap up” nasty webs in seconds making them look like a wad of cotton candy. This makes for effortless web removal (just don’t eat it!). And kids love them too. These come with adapter so you can mount them to the same poles that hold the Web Remover heads. 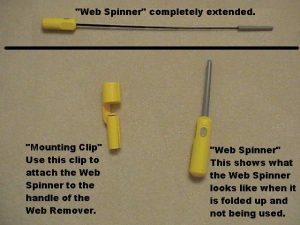 The Web Spinner comes “contracted” and is about the size of an average screw driver. But the spinning rod body extends like a radio antenna to over a foot in length and when turned on, will quickly collect any web within reach. Web Spinners can also be ordered in “kits”. We offer three kits, basically the 5-10 Ft, 14 Ft and 30 Ft Web Remover Poles and Heads along with the Web Spinner. 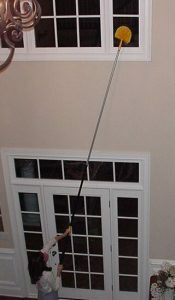 The Web Spinner fits on all three poles and is an excellent tool to use for web removal. Remember, the big reason to remove webs is to get rid of developing egg sacs which will not be killed with the spray you also need to use. By removing the spider webs you will also be removing egg sacs and this is super important. Once the spider webs are all removed, spray the homes exterior with FENVASTAR. This fast acting concentrate is “hot” on spiders. They don’t like it and will quickly die from the spray. Plus it will flush them out from hidden cracks and crevices where they like to hide. 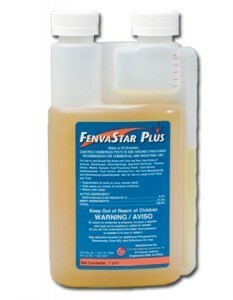 Fenvastar mixes .4 to .8 oz per gallon of water and each gallon of mixed solution should cover 750-1000 sq/ft. For the average home, you should spray 2-3 gallons of mixed solution. Be sure to spray the foundation, around window frames, door frames, soffit areas, vent openings, exhaust areas, mounted lights, air conditioning areas, cable entry points, deck areas, stoop and patio areas. Fenvastar will flush out spiders so expect to see dead spiders within an hour of spraying. Plan on treating 2 weeks later to knock them out for good. The only “trade off” with Fenvastar is that treatments won’t last more than a month. This is a factor of the formulation; Fenvastar is a true “EC” which means emulsifiable concentrate. The advantage of using an EC is that it will work quickly and “penetrate” known hiding spaces of target insects. This is always good when treating initial problems. But it also means you’ll need to treat once a month to keep an active residual in place. 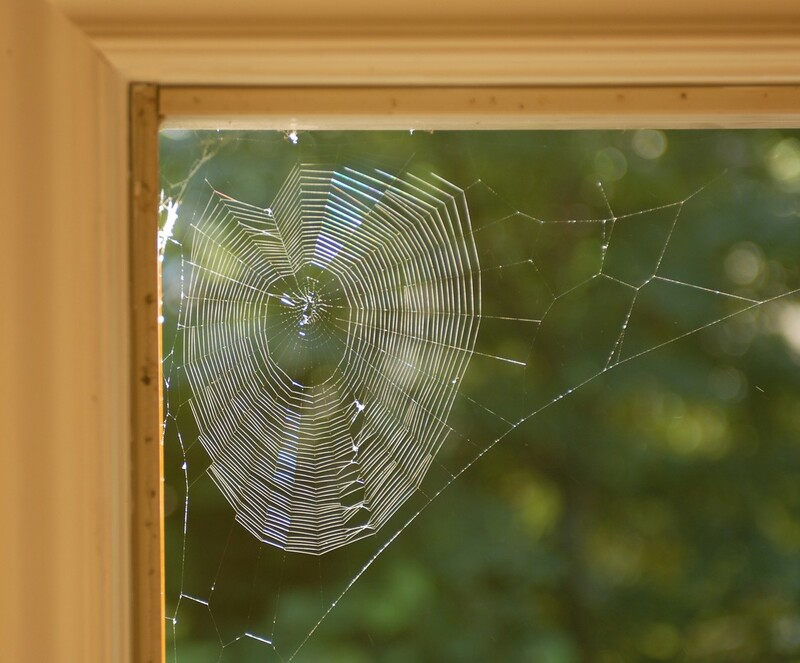 For longer windows of protection, change to DFENSE SC once the spiders are under control. Dfense is “micro-encapsulated” which means it won’t break down nearly as fast. Treatments will last 2-3 months and therefore you won’t have to spray quite as much. But Dfense will not kill quickly so for active problems, start with Fenvastar and change to Dfense when you run low on the Fenvastar. Dfense mixes .75 to 1.5 oz per gallon of water and like the Fenvastar, plan on using 2-3 gallons of mixed material to get the average home treated. Assuming your spider problem is under control when you start using this formulation, treating every 2-3 months should keep things under control. When using either Fenvastar or Dfense on the home, you’ll need a good PUMP SPRAYER. Our sprayer will reach heights of 15-20 feet and even higher with a little extra reach. Another great way to spray up the side of the home is to “fog” out the treatment using a misting machine like our FM6208. 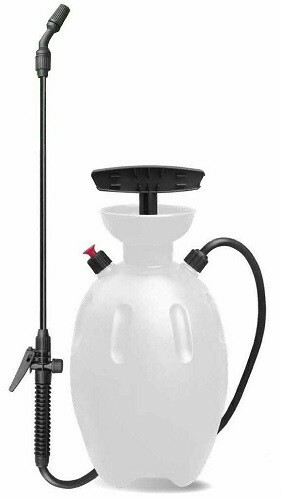 This electric machine features a one gallon tank and will propel the spray a good 25-35 feet up. The advantage of using a mist over a liquid is that the mist covers everything. This ensure spiders can’t hide or miss the treatment. And fogging is a lot more easier to do. One gallon of mixed product will cover the entire home too so it will use less product and a lot less time. 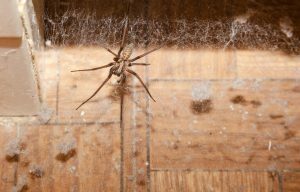 Once the outside of the home is properly treated, spiders won’t be invading attics, crawl spaces or living areas. But if you already have active spiders, treating inside will be required. This is true because spiders living in attics or crawl spaces can be so successful, they often times will generate big populations of spiders which will naturally migrate into living spaces. This means your home could be under attack from spiders being generated from inside the home. To deal with the possible sources of spiders, you’ll need to at least treat living spaces where spiders are being seen. For most homes, spraying baseboards with either the Fenvastar or Dfense listed above will do the job. But since spiders like to hide in cracks and crevices, treating around windows and doors with FS MP AEROSOL where you can’t spray liquids can help. FS MP uses the same active as Fenvastar which is very irritating and quick killing on spiders. Each can comes with a small tube injector used to direct the spray into the areas where spiders like to hide. Plan on treating once a month when spiders are active; less when no spiders are seen. To help manage the problem, set out SPIDER TRAPS in rooms with activity. These traps can be set on counter-tops, under furniture, along baseboards and under beds. Don’t expect them to “control” an active problem but instead, use them as a way to alert you to a problem you may have otherwise missed. As stated above, spiders will often migrate into attics and crawl spaces and find enough food to live and breed. From these locations, their offspring will migrate into loving spaces producing an ongoing spider population in living spaces. To stop the invasion, apply DELTAMETHRIN DUST to these spaces. Deltamethrin dust is a super stable insecticidal dust insect pests like spiders do not like. Where applied, the dust will kill them. 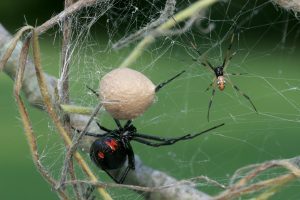 And once in place, spiders and other pests won’t be able to use the area for nests. They’ll detect the dust as they enter treated zones and in turn, move away. Deltamethrin Dust is similar in feel to baby powder. When “squirted” out into open space, it will fall to the ground and not fly around much like other less dense dusts. When applied using one of the dusters listed below, the dust will get “charged” as it enters the treated zone and this static charge causes it to adhere to all surfaces well further enhancing its performance. Plan on applying 1 lb for every 1,000 sq/ft of surface area. So if your attic is 30 feet wide by 40 feet long, you’ll have 1200 sq/ft. But remember to dust the decking of the roof which will add another 1,000-2000 sq/ft depending on how much surface area is above the floor. One of the big benefits of using Deltamethrin Dust is that unlike aerosols and liquid sprays which only last a month or two, treatments with this product will last a whole year. To apply the dust throughout the attic, use a DUSTIN MIZER. This device is manually operated and will enable you to blow the dust a good 20-30 feet out ensuring good coverage. If you have a huge attic to treat, the B&G ELECTRIC DUSTER will get the job done in little time and will blow the dust 50+ feet. It runs on electricity and is most definitely a commercial tool. Its so powerful, spaces 1000 sq/ft or larger can be dusted in just a couple of minutes. We offer this tool for sale and for rent. The unit is $350.00 to buy and own but you can rent it for less. To rent, you’ll pay $250.00 to get the unit which includes a return shipping label. You get to keep the unit for 3 days after you receive it and then using the return shipping label, you can send it back. Crawl spaces should be treated like attics too. These are prime locations for spiders but once dusted with Deltamethrin, you’ll eliminate these locations as nest sites. The good thing about Deltamethrin is that it covers most any pest including camel back crickets, roaches, ants and even termites. To get the most benefit from dusting your crawl space, make sure all cracks are sealed and vents closed prior to dusting. Lastly, since Deltamethrin is such a long lasting agent, its not a bad idea to dust any route of entry to living spaces like light fixtures, behind switch plate covers and around windows. For these application, a CRUSADER HAND DUSTER is well suited. WEB OUT SPIDER WEB REMOVING SPRAY is one last product worth mentioning because of its unique ability to “repel” spiders and stop the formation of webs. Web Out won’t kill insects but instead, it simply chases them away. 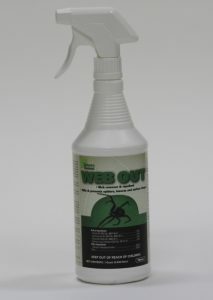 Web Out uses all natural food grade actives which were discovered to be annoying to spiders. When sprayed on walls, ceilings, around windows, under soffits and basically anywhere spiders webs have been an ongoing issue, Web Out will both keep the area web free and force spiders to go elsewhere. Because its made with all natural food grade actives, Web Out is well suited for use in rooms where elderly or chemical sensitive people reside. Web Out is also fine to use on a boat or boat dock without worry or concern about contaminating the water below. Web Out is ready to use and the quarts will cover 200-300 sq/ft. They come in a “spray bottle” with an adjustable nozzle so you can shoot a pin stream or wide swath as needed. 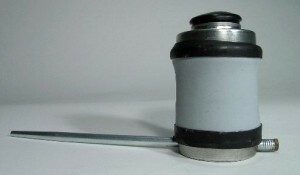 Gallons will require a PUMP SPRAYER like the one above to apply the product. To get the best results as possible using Web Out, first remove all visible webs using our Web Remover seen above. I have very small spiders in my bedroom and they get into the bedsheets at night and bite. Also, I have black widow spiders in the yard and don’t know how to get rid of them. 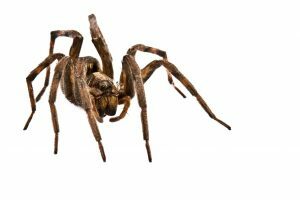 If you review the article above, you’ll learn about how to do spider control in and around the home which it sounds like you need to start doing. In the article we explain that spiders will first gather around homes where pest control isn’t being done. The first sign of this is seeing spider webs up under soffits, around windows and by outdoor lights. Once they start nesting on the house, it’s just a matter of time before they start coming inside and the ones that will be seen inside first will almost always be small, baby spiders. So what you’re describing sounds exactly like what typically happens as spiders move onto and then into a home as they infest it. To control the problem, you should first remove all the spider webs on the outside of the home using a Web Remover. Next, get one of the concentrates listed above like the Deltamethrin and start treating the outside. Spray the siding of the home, around doorways, the foundations and basically anywhere you see spiders were nesting. This treatment should be done with a standard Pump Sprayer and will require 2-3 gallons of mixed solution. Once the outside is treated, you should move inside and first apply some Phantom aerosol to all the baseboards and other areas where spider webs are seen or spiders are found to be active. Phantom is excellent to use inside the home because it’s both odorless and goes on dry. For that reason it’s ideally suited for inside use. Lastly, install some Spider Traps to help monitor and catch any the spray misses. These are excellent tools which are easy to deploy and very effective. Once you start following this treatment regime, the spiders will quickly be under control and if you retreat every 1-2 months, they won’t come back. Traps can be replaced every 3 months (or more frequently if they fill up fast) and the inside spray can be used more frequently if needed but I have found using it once every 5-6 weeks keeps all pests under control in my home. Your article was very informative thank you for the knowledge on spiders. I have a lake front cottage and they a huge problem. Where is the best place to purchase these sprays in the concentrated form? Since these are professional grade concentrates, they’re not easy to find and won’t be carried by common big box retailers so ordering from us is the best way to go. We ship all over the world and most every order we get on line through our shopping cart or via the phone is shipped within one business day. That means you’ll have your order in just a couple of days. And since we’re a small business that’s trying to stay alive in this harsh economy, we need every order we can get so please show your support and that you value our online information by placing your order with us! Thanks in advance. Please advise how much would be required for 1400 square feet – as well does a maintenance plan have to be done yearly? Also for other buildings totaling the same? Can you be a little more specific? I need to know if you’re asking about the inside treatment, the outside treatment or both. And then are you wanting to know how often you’ll need to treat? I’ve used your products before and they are great! I know there are several options for controlling spiders, but do you suggest a particular one for huntsman spiders? We have so many of them here in SW FL, and we’ve been told it’s almost impossible to stop them from coming into the house because they flatten their bodies into any opening. They are rarely on the ground, we usually find them up high on the walls. Thanks! Huntsman spiders are readily found above ground and will nest on the exterior of most any home. This is why treating the outside is very important if you want to stop them from entering living spaces. To achieve this goal, there are three things to use. First, apply a 10 foot wide band of Bifen Granules around the home. These need to be spread over the treated zone and are meant to intercept the huntsman as they traverse the landscape looking for a new nest site. Renew the granules every 2-3 months as part of your regular pest control program. Second, apply Cyonara RTS to as much of the homes siding as you can reach. That means you should start by spraying up high and as you spray, letting the overspray trickle down the siding which in turn will get the lower section of the home treated. Be sure to spray around soffits, overhangs, windows and rain gutters since these are the most common areas used to get inside any home. If the home is large, get the Bifen XTS (seen on the Cyonara page) since it will go a lot further and prove more cost effective over time. Renew this application every 1-2 months. Third, inside the home you’ll need to apply Phantom Aerosol to every window and door frame. Pay particular attention to where the window seats on the sill. This is a great place for any pest to enter. Renew these treatments monthly. Fourth, if you’re finding the huntsman on the second floor of the home or suspect they might be coming in from your attic, treat the space with Deltamethrin Dust once a year. Lastly, set out 6-12 Spider Traps in the home. They’ll serve you by both capturing foraging pests and alerting you to problem sections of the home otherwise missed. We live near a lake and have a horrible time with spiders and their webs…clean our outdoor areas daily of webs and then do it all over the next day!. Help!! We use Terminex as our professional and they don’t seem to be able to get a handle on things!! I’d go with Suspend making sure to spray as much of the exterior of the home as possible. Do this once a month when they’re active; every 2-3 months once under control. Inside the home apply Phantom Aerosol to as many window sills and frame runners as you can. Also treat your baseboards, door ways and other locations you find them inside. Phantom is odorless and lasts 2-4 weeks making it ideal for use inside. Spider traps should be deployed too since they’ll catch foraging spiders and alert you to areas of the home that maybe need extra treatments. Lastly, use a Web Remover to take down as many spiders and their webbing as you can. You’ll need to use this tool on a regular basis. I use mine once a month around the exterior of my home and then right after I take down the webs, I spray. After the first 1-2 treatments of the year, I don’t find many webs for the rest of the warm season so getting an early jump on them can really help. I live in Kansas; we just moved into a new rental property. I have gone around the outside of the house and got rid of all the spider webs, as well as sprayed with some spray, however now they are moving into the inside. To make matters better, we had the satalite installed and they drilled two holes into the floor, one in the living room and one in the bedroom and didn’t seal them. I thought I had caulking however I’m out (will be picking up some tomorrow). The spiders I have killed so far have been two brown recluse. I need something to kill them all. I have read your article, however not sure what would be the best products to use. Any help would be greatly appreciated, and the sooner the better so I can place my order. Thanks. Since spiders invade from outside, the best way to keep them out is to first remove as many webs as possible from the home. I find the Webster to be handy for this and use one all the time around my home and boat. Next, I like to spray the exterior of my home with 2-3 gallons of Deltamethrin. I’ll focus the treatment where I think the spiders are most likely to make webs. This is usually around windows, doors, lights, etc. Now if I have a lot of ground dwelling species like wolf spiders, I’d also apply some Bifen Granules. Apply the granules and liquid every 1-2 months and you should be able to keep spiders and other pests off and out of the home. Now for inside the home, I use Phantom aerosol all the time. It’s odorless and goes on “dry” making it ideal for me since we have a lot of hardwood floors. For me, that’s all I need to use since I don’t have a current problem. For you, I’d say to do the same at least but then you might need to also dust the attic with Drione if you believe you have spiders active in this area. This treatment will help with any pest wanting to use that area and the application will last for a year so you won’t have to treat frequently. I’d also set up some spider traps. These will help identify key parts of the home you need to watch and monitor so you’re aware of problems before they get out of hand. Can I use Bifen it to control spider and other insects? Bifen is a good product for most pests including spiders so yes, it can be used. 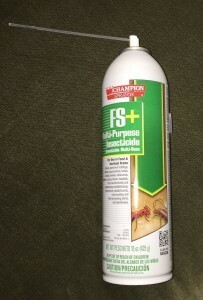 Personally I use it a lot since it’s odorless and works great for flying pests like mosquitoes, gnats and wasps. Obviously if you see spiders active, you need to spray. But my guess is you’re wondering when you should start spraying so you don’t develop a problem? Well, there really isn’t a specific date and since weather will vary from year to year, so too will the date when you should start. That being said, here in Georgia I typically start seeing spiders on my boat late February. So this year when I started going to my boat in March, I was shocked to see not one spider. And here we are in the last week of April and still, no spiders! My point is the date to start will no doubt vary from year to year; region to region. And that will be true for all areas of our country, including the south. But the one common rule you should try to follow is to and spray before they start. This will always make the process that much easier to handle. So for me, I’ll start treating in the next week because I know they’re long overdue. And since you’re in N.J., I’d say you’re close to them getting active. Maybe in 1-2 weeks; certainly before the end of May. So I would think that if you make a point to start spraying by tax day (April 15th) for future reference, you would be fine. Get a good application of Suspend or Cypermethrin applied outside the home along with some Phantom inside and you’ll be good as spring kicks in. i too have just moved into a rental place since this past march. we are starting to see more and more spiders. before we moved in, after we paid the money, we found that the home has roaches. i do know there are more than one type of roach but don’t know the names. we have about 4 different species of spiders and its freaking me out. i have an 11, 6, year old and a 7 week old. my husband isn’t as worried as i am. on the outside of the brick exterior their are holes with webs every where. all over the house. what products should i use? Ideally, heres what you should do. First, I’d remove all the webs on the home using a Web Remover. Next, I’d spray the exterior siding of the home with Defense. 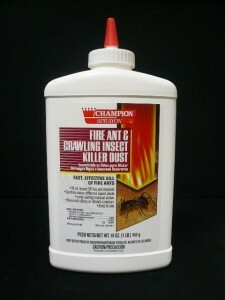 Its odorless, works well on spiders and will knock out any other perimeter pests too. As for the roaches; I wouldn’t spray anything inside. Instead, I’d use nothing but Gel Bait. Set small dabs out inside, about the size of a grain of rice, where you see any roaches active. The roaches love this stuff and will easily find and feed on it. Once this happens, they’ll die. I have a house on a private lake surrounded by 50 acres of wooded property. I have cleaned the property back away from the house. The house is a single level home with a crawl space. There is also a boat house. I have a deck that surrounds half of the house. Two different companies have treated this property inside and out for both bugs, spiders and rodents (mice) over the years. I too have the same problems that most others talk about with regards to spiders and there webs outside. We visit this home two weekends a month. I am looking to take over the job of treating this house myself. It also has a large attic space. What products should I purchase from your company and what steps should I use. I guess I am asking you if this was your home what steps and products would you use. No doubt servicing this property is something you can handle. And it shouldn’t take too much time. With the right products and advice, you can definitely do at least as well compared to any service company. We also find that since property owners are more inclined to use the right amount of chemical, the chances of better results are increased once you learn how to do the work properly. So if this was my house, here’s how I would proceed. First, I’d treat the attic and crawl space with Delta Dust. Using a Dustin Mizer, I’d blanket these spaces with the dust. A thorough application will remain active for 6-12 months and will control most any perimeter pest including spiders. Next, I’d invest in one of our misting machines and use it to apply Essentria IC most every time I came to visit the property. The use of a mist will enable you to cover a large area thoroughly and with a lot less chemical compared to spraying a liquid. This means you’ll be saving chemical costs and time so after a few years of using the equipment, it will effectively pay for itself. But there are two other very important reasons why I believe the mist is the way to go. 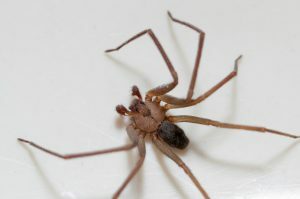 The first reason is that spiders can be hard to control using a liquid when they’re nesting on high areas of the home. This is just a normal problem that is present because of how spiders nest (using webs). So because they don’t actually contact the surface of your home, they can easily circumvent the treatment leading to extra applications, frustration and lost time. Now eventually you should be able to figure out just how much it will take to control the local populations and where the important areas are located on your home. But using a mist will overcome this learning curve immediately and this will make the process easy to manage. The second reason I’d get a misting machine is because I happen to keep a boat on Lake Lanier here in GA. And since its under a covered dock, I have a huge problem with spiders. They nest on the boat and overhead. I mostly use Phantom aerosol to combat the invaders but every now and then I lug my misting machine up to the dock and it does the job better than anything else. Unfortunately my dock is some 18 miles away so its not convenient for me to use the mist blower all the time. But when I do, misting it with Essentria keeps all the spiders at bay (along with wasps and any other pest) the best. So if you expect to be treating your dock and/or boat, the misting machine would be ideal for this option. Especially since your dock is in your back yard! Alternatively you could go with the Deltamethrin concentrate (which mixes with water) applied as a liquid. This can do the job if you believe you’re only concern will be the house. The key here is to use enough and to be thorough when spraying. Just understand it will take a good 2-3 gallons of mixed chemical to treat the right way when using a liquid whereas the same area could be treated with a gallon or less using a mist. 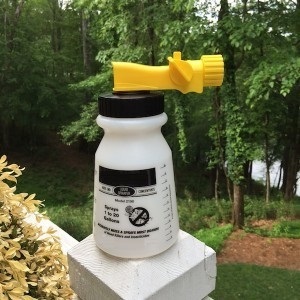 But liquid treatments will work so this is very much a viable option; because you asked what I would use I had to bring up the misting machine because if I had a dock in my back yard, I know its what I would be using so I could do everything all at once. In fact I treat about 3/4 of an acre using 1-2 gallons of mixed chemical in my Back Pack Mist Blower. Its super portable, easy to use and I can get the job done in less than 5 minutes. During the treatment I’m spraying the sides of my home (which are prone to spider webs since I live in a wooded area along a large river), the yard and a good 1/4 acre of wild area. The house has sides that go up 50 feet in some areas so the house is tall. But the mist blower can handle it shooting a mist clear to the roof no problem. And when needed, I’ll bring my mist blower to the lake dock so I can treat certain times of the year when things are “bad”. But most of the time I’m using Phantom Aerosol on my boat and on the roof over it. Its just easier; as stated above its not easy lugging my mist blower to the lake all summer long. But for you, treating the yard, home and dock at the same time would be easy and something you should consider. Lastly, why use Essentria in the mist blower? First, because its labeled for use over any kind of water like a lake, pond or river. 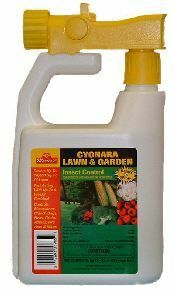 Second, it works great on spiders, ants, roaches, mosquitoes and pretty much any biting, annoying pest found in the yard. So if you want to control everything with one active ingredient, this would be the way to go. Give us a call if you care to discuss any of these products in more detail but if you review the links below, you’ll be able to learn more about them by checking them out first in our shopping cart. I have an older home with some unattached building structures on about 30 acres of wooded/pasture land. We currently have realized we have a brown recluse infestation with about 200+ found/killed so far. I am looking for some specific product information for chemical and tools for specific questions. 1. What is the best approach to treating the perimeter of the outside (including some of the woods around the house). Granules vs mister vs other? 2. What is the best product to apply to kill the recluses on my outside structures (barn, playhouse, poolhouse) where no one is currently living? These are areas of high concentration for the spiders and I need something I can apply but would also like something I can place on my firewood stack that will not be harmful when I burn it in our indoor fireplace. 3. What is the best chemical for treating outside doorways, windows? 4. What is the best chemical for treating inside the home, or should I use a combination of dust and spray. 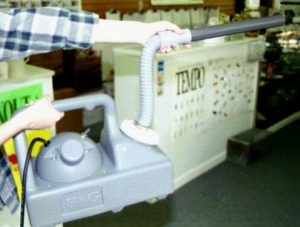 Based on the size of the area you need to treat, I would strongly urge you to consider getting our Mist Blower. This would enable you to treat the property most efficiently for two reasons. First, it would reduce your treatment time dramatically. For me, I find it takes 45-60 minutes to treat my acre lot using 20-30 gallons of diluted liquid material. But using my mist blower, I can get the same area covered with just 2-3 gallons in less than 10 minutes. True, the machine will cost to acquire. But it will more than pay for itself in 1-2 years with the savings realized via the reduction in chemical needed and the time required to maintain the areas you listed. No doubt for anyone treating an area like you described, the overall savings would add up quickly so the machine would be well worth the investment. As for which product to use; go with the Deltamethrin Defense. Mix .75 oz per gallon of water (mist or liquid spray) and use it on all the exterior siding, soffits, etc. of any structure you want to protect. This chemical is odorless, lasts 30-60 days and won’t pose any kind of hazard if you decide to burn wood which has been sprayed. 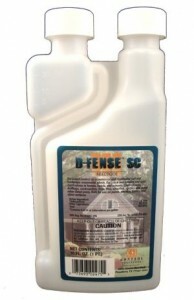 Defense works well on most any pest including spiders and yet won’t bother plants, shrubs, etc. Its a good option for mosquitoes too. I also recommend using Bifen Granules around the foundation of all structures you want to protect. This would insure spiders can’t get to the structures via the ground but it will also insure there isn’t a good source of food in this area. Treat at least 5-10 feet out from the foundation and renew the treatment once a month. For inside the home, Defense can be mixed in a good pump sprayer and applied to baseboards. Labeled for use on carpeting, it won’t pose a hazard to people or pets and won’t be visible where applied. But if you have “sensitive” areas you don’t want to spray with a liquid, go with Phantom aerosol. This low odor material is ideally suited for use in sensitive rooms with hardwood floors or other substrate not conducive to liquid applications. And if you don’t have a good sprayer for inside/outside the home, our private label model is built for the job. Personally I use the Phantom in my home and on my boat all summer long for spiders and mud daubers. Treatments are invisible once allowed to dry and they last 2-4 weeks – even in the harsh water environment. Lastly, any damp crawl space should be dusted with Deltamethrin Dust but if its dry and if you have an attic space you want to treat, go with the Drione dust. Best suited for arid areas, Drione will last 1 year or more making it far superior to the Deltamethrin dust. Use a good hand duster to apply the dust in any crack or crevice; use a Dustin Mizer for treating crawl spaces or attics.